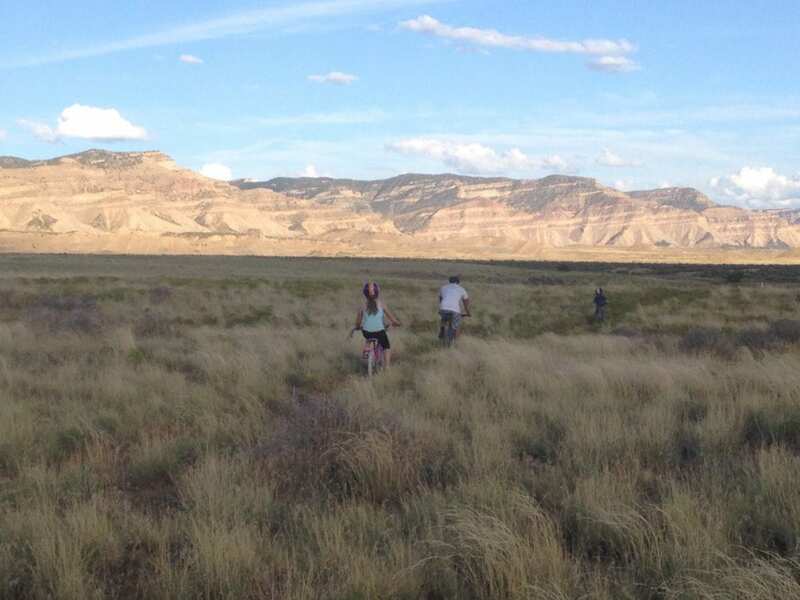 Gorgeous views of the Bookcliff Range, when mountain biking on the trails in Fruita, Colorado. Photo by Tami Mittan. 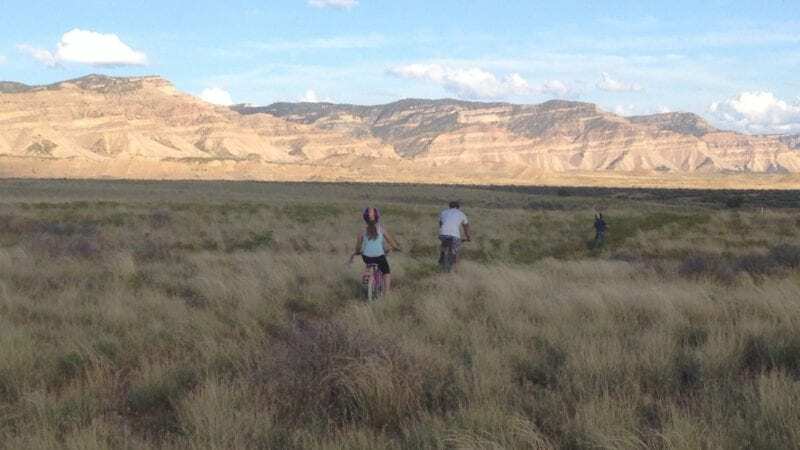 Here’s why you should try mountain biking with the kids–and everything you need to know to make this an outdoor adventure to remember…in a good way. Find out what to consider for your child’s ability level and get tips for those new to mountain biking, including what to bring and what type of bike you’ll need. Read this and you’ll find it’s easy to incorporate mountain biking with your next family vacation. Now that my youngest son is age 5 and he has graduated to riding a two wheeled pedal bike, we decided it was the perfect time to embrace family biking. And although taking a leisurely bike ride down the street through town can be fun, riding on a scenic mountain biking trail takes the fun to a whole new level. 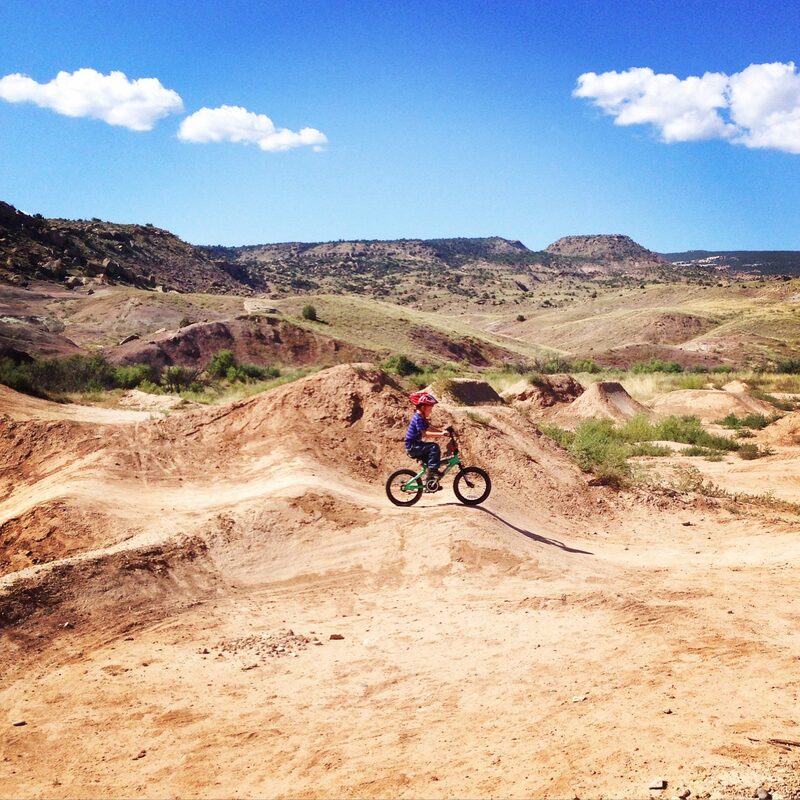 Located a few miles from our home, the legendary mountain biking trails in Fruita, Colorado, have been beckoning us. Although it meant a bit more effort than our typical outdoor adventure of going hiking, lately my family has been exploring mountain biking together in this area. And holy cow, has it been a good time! I’ll warn you… mountain biking with children may mean experiencing moments of whining, reluctance, and even a crash or two. But at their heart, most kids absolutely love to play outside. Once everyone warms up and gets used to the terrain and feel of their bike, it’s hard not to have a good time. 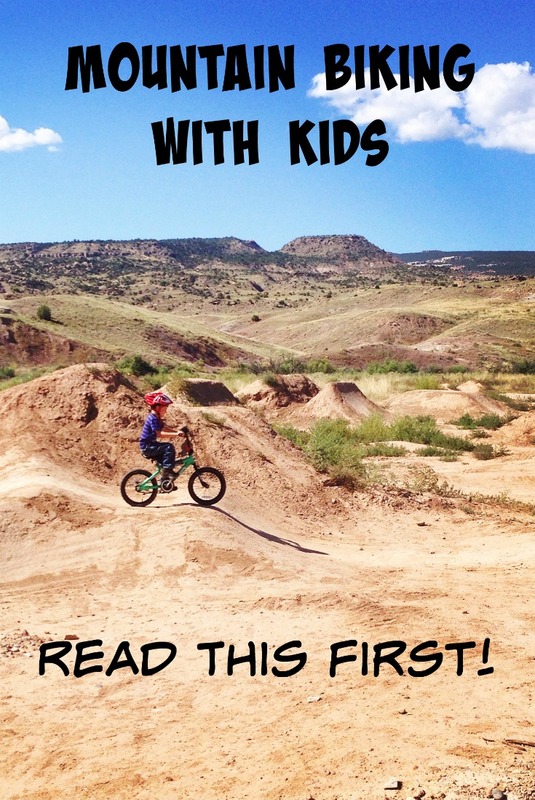 Here are some family mountain biking tips we’ve picked up along the way. 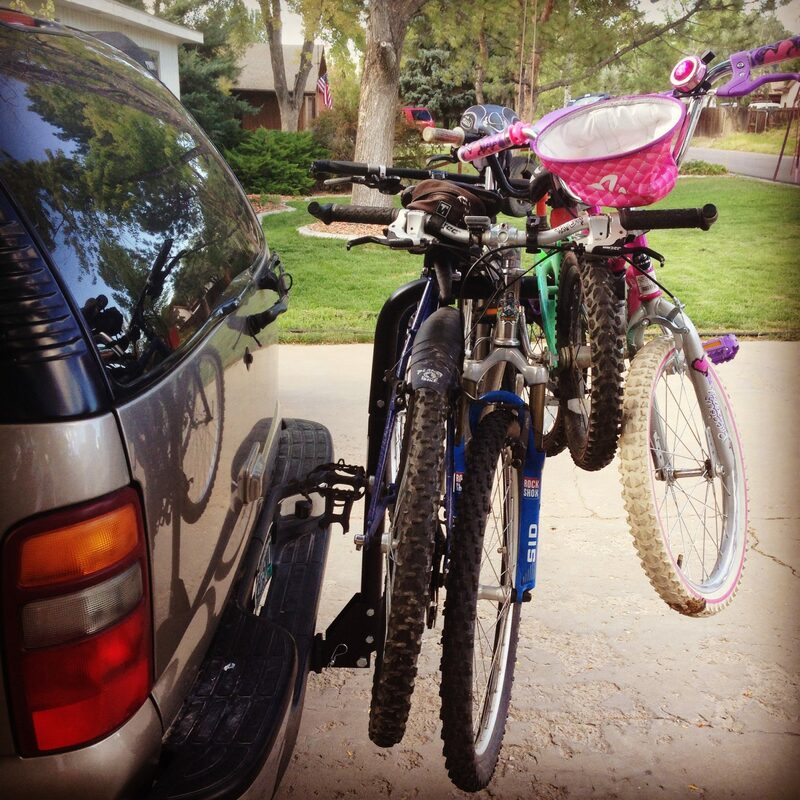 Family Mountain Biking car bike rack.jpg: Cheap and easy to use, trunk mounted bike rack. 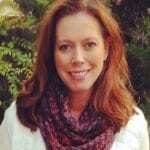 Photo by Tami Mittan / Outdoorsy TravelingMom. My kids are ages 5 and 10, and are still both just riding a generic, one-speed bike. For the youngest, this is fine and about all he can navigate right now. But my oldest is definitely ready to handle a real mountain bike. She’s got sufficient coordination to shift gears, and it would definitely make the ascents a lot easier for her. Hence, the Barbie bike is slated to be replaced soon. If you are new to mountain biking, a hybrid or a mountain bike will be your best bet for trail riding. That road bike probably won’t cut it. While there are varying technical level of trails available, even on beginner routes you are you going to want a fatter tire and additional tread. Water. And helmets. Promise me you won’t mountain bike without these two necessities. Aside from those core gear essentials, other good things you’ll be glad to have along include sunglasses, sunscreen, and snacks or energy bars. Wearing a light hydration backpack works really well, allowing you to hydrate hands-free throughout your ride. You can wear shorts or long pants, but be sure you don’t have a loose pant leg that will get caught in your bike chain. Tucking pant legs into socks may not win you any fashion points, but it can save you grease-stained, torn pants and a potentially bloody wreck. Which is totally worth it. Lastly, if you aren’t used to riding in a bike seat, padded biking shorts can be your best friend. I’ll admit that the logistics of how to actually GET four bikes to a good trailhead held us back for a while. There are all manner, and price points, of bike racks you can purchase for your vehicle. We found a cheap trunk mounted rack for less than $100 on Amazon. It’s easy to use, and is sufficiently sturdy to transport our four mountain bikes on a journey of about 40 miles round trip. New to the two wheeled pedal bike scene, my 5 year old practices his riding skills on the Tabeguache trail. Photo by Tami Mittan / Outdoorsy TravelingMom. If you are vacationing in a location known for outdoor recreation, why not check out some of their biking trails? It’s a perfect way to have an authentic experience in the area. This doesn’t have to be as daunting as it sounds, nor does it mean you have to haul all of your family’s bikes along on the entire trip. Not only will local bike shops often offer bike rentals, they will be highly knowledgeable about which nearby trails to recommend to your family. Be honest about the ability level of the riders in your family. Select a distance and length of ride that is reasonable for your group. Your bike outfitter can provide directions to the trailhead, and fit you with the best bikes for the job. Especially in venues like Colorado… mountain biking has the potential to be dangerous. Advanced mountain bikers can perform technical moves that would boggle your mind (think hopping up and/or down boulders) and some trails feature frightening terrain. Don’t be afraid to walk your bike through any sections that are just too scary or steep for your comfort level, especially with kids. Most trail systems offer maps that include difficulty level descriptions. There’s no shame in sticking to the beginner trails. Also keep in mind your child’s current fitness level. Biking is a fantastic way to get kids active, but if their current lifestyle hasn’t included a lot of regular exercise – this may be a stretch for them. It’s still a great idea, just start with a shorter distance so as not to overwhelm them. Keep it safe. I know I still have wonderful memories of when I was a kid, biking together with my family. Family mountain biking can be fantastic way to have an outdoor adventure with your kids. Get some fresh air, see some lovely sights, and have a great time playing together as a family.